Another bland salad recipe... hold your horses! This is not your typical boring salad. 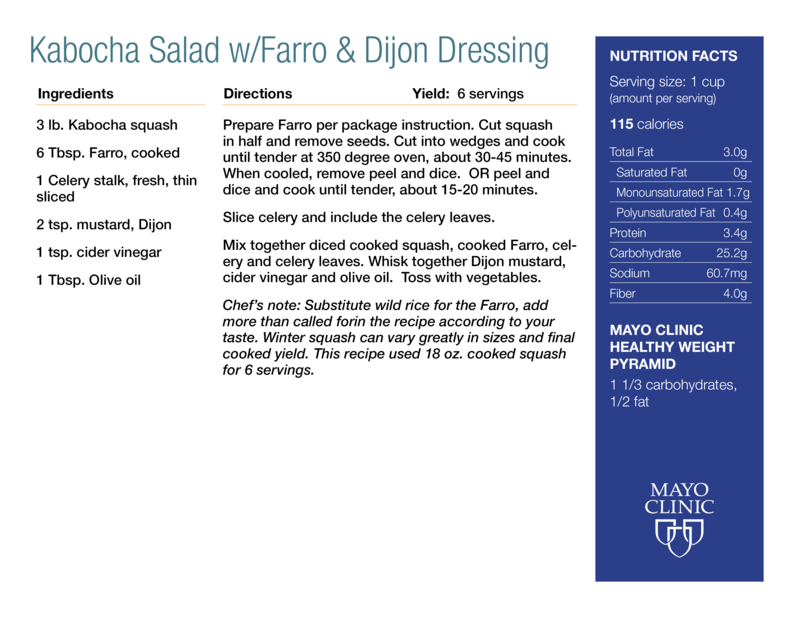 This recipe is bulked up with kabocha squash, packed with a texturized punch from the farro, and a dijon dressing to satisfy your taste buds with this sweet and savory hearty winter salad. Since this is published on the Mayo Website and highlighted in the "This week at Mayo Clinic", why is it necessary to send out Multicolored large Postcards internally to all the employees? This is a hugh expense for Mayo! I agree with Faye, the speed of which these postcards landed in the recycling bin was incredible in my department. I appreciate trees as well, however, please don't think that every employee is able to read anything/everything that is produced on line. Time is a very limited factor as well as an overbundance of information/communication from so many directions. All advertising is dependent on a receptive audience. This is enhanced by multiple and varied media presentations (Radio, TV, Paper, Internet). Each media has it's own strengths — and weaknesses. Print/mail HAS TO BE handled. On-line media can easily be overlooked/ignored.